Take a combination of skill, passion and inspiration and you have the ingredients for a talented artist, when that inspiration comes from the Dartmoor landscape, its mysterious legends and places, then you have Rachel Jennings the textile and mixed media artist. In fact the above statement is far too simplistic as this artist works in papermaking, weaving, stitch and in her own words; ‘anything else which gives me the effect I need. Rachel is influenced by many things; nature, poetry, music, dreams, myths and stories from her surrounding Dartmoor landscape to name but a few. 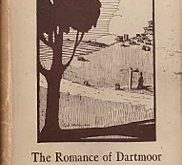 It is a combination of these elements that make her various works unique and have earned her a place amongst the noted modern artists of Dartmoor. I am always fascinated by where and why are peoples’ favourite spots on Dartmoor and in Rachel’s case it is the enigmatic rock pile of Bowerman’s Nose. She explains how, “each time I visit, I’m amazed all over again that a natural rock formation can look so intentional and inspire so much legend and art.” Her trips to Bowerman’s Nose could well become a legend in their own right because after every visit she leaves ‘him’ an offering of a chocolate biscuit or a gingerbread man at his foot. So, just like the mysterious flowers which appear on nearby Kitty Jay’s grave, Bowerman gets his mysterious treats – thanks to Rachel. I thoroughly recommend a visit to her website (see link above) to see for yourself her evocative work or better still if passing Seale Hayne pop into her studio where a warm welcome will await – chocolate biscuits not guaranteed. It would be a hard task but if I was to be asked to pick my favourite from her range then I would opt for her work entitled ‘Star-rise at Merrivale’. Why, because you have the ancient stone row that draws your eye to the constellation of Pleiades. It is said that when these stars are seen rising it is a good indicator to begin the harvest, a fact represented by the feint pattern of ears of grain portrayed in the background. The scene is completed with the addition of a hare which is a fertility symbol as well as being one of Rachel’s favourite animals. All in all very evocative and so representative of the mysterious and ancient ritual complex of Merrivale. A new timely addition has been added to her portfolio entitled ‘Siward’s Cross’ which shows a beautiful snowy scene along with a robin sat atop the old granite cross, to me this would make a very special Christmas card to sit on the mantelpiece.